We are presently involved in the restoration of a Victorian Church in Leeds, this is an extremely exciting project. It’s lovely to take something that has been well crafted many years ago but has been somewhat neglected and to restore it to its former glory whilst also adding new components to complement the old. The church has changed denomination and the needs of the congregation have meant that a new layout for the church is required. This Victorian Church is stunning and as a listed building we had to take care. We lovingly took the old pews, dismantled them, amended them into new sizes to suit the new layout, and stripped and re-polished them. We love restoration jobs and have been proudly doing them for decades. We were also commissioned to craft a tribuna and lecterns for the front of the Church out of solid mahogany. A tribuna is where the minister and fellow preachers stand to conduct a service. As with the pews, the internal and external doors are listed and therefore closely monitored by British Heritage. The existing doors are being carefully restored and two replica doors with frames are being constructed in the same style and timber. We and our clients are thrilled with the progress so far and are happy that our work will be admired and loved by the church community for many years to come. We are looking forward to starting another church restoration in the coming weeks, this time in Sunderland. This new church will present an even bigger and more demanding challenge. Restoration jobs like these help us tone our craft and showcase our many varied skills. 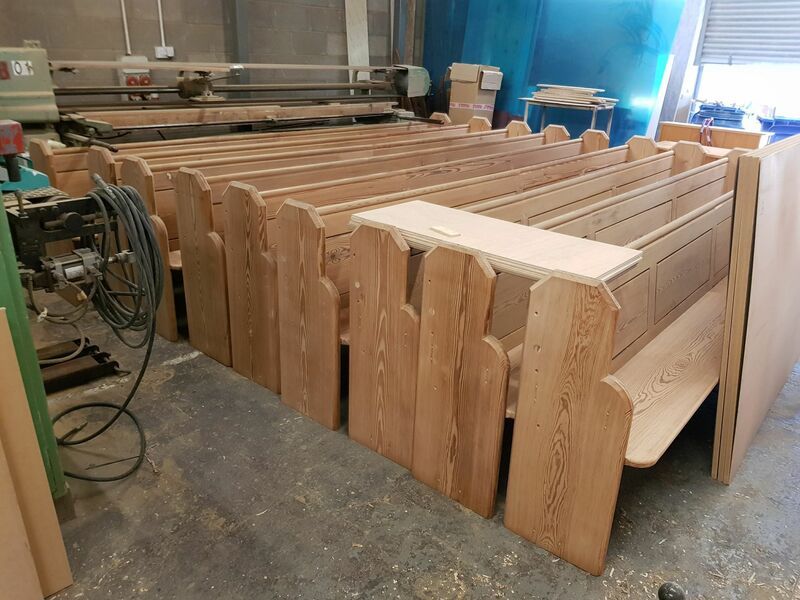 We can transfer all of our decades of experience into making beautiful bespoke furniture pieces for one-of-a-kind homes and hotels with a difference. Why not check out our full range?